Cues and images are very personal. 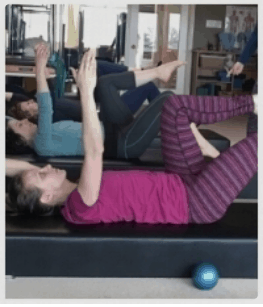 As Pilates teachers we know that we can offer a cue to a group class and get 5 different responses as to how that cue is embodied. The direction to simply “Stand Up Tall” can illicit a variety of responses from improving posture and alignment, to worsening posture and tension levels and adding excess neck strain. There are many cues that are widely used in the fitness world that rose to popularity because they get a good physical response from almost everyone. The following 3 cues though highly popular, may need to reconsidered. Or at least we should self assess to ensure they are giving us the intended responses. Let’s examine. This classic Pilates cue directs one to actively draw the front of the ribs together, often on an exhale during abdominal work on the mat. Intended Goals: Activate core strength in the abdominal muscles and/or improve ribcage alignment by limiting hyperextension. Common Negative Result: Bracing and Compression. Knitting the ribs often results in bearing down and bracing the abdominals, increasing pressure in the back, and pelvis and limiting the breath. Alternatives: Allow the back of the ribcage to sink down, towards the mat. Breathe easily. Draw the low abs up, and deepen the abdominals as appropriate to the task. Note: Remember the essential rule of efficiency. For a low load exercise the upper abdominals don’t require strong engagement and certainly not narrowing the rib angle. Often cued in arm work clients are directed to pull or draw the shoulder blades back and down. Intended Goals: Stabilize the shoulder girdle and lessen neck strain. Common Negative Result: There is a difference between releasing tension in the upper shoulders and actively pulling them down. Addressing tension with tension, will ultimately limit the range of motion and stress the shoulder joint or neck. Alternatives: Practice gently shrugging the shoulders up, and then letting them melt down, instead of pulling down. Try this before arm work and even play with maintaining a slight suspension of the shoulders for arm work. Note: if the arms elevate to 30° or above the shoulder blades will start to move – you want them to. So in an exercise like the Offering, or Swim Prep, there should be plenty of movement of the scapula and the clavicle. Cueing that rigidly anchors the scapulae in place during arm motion can have a negative effect. 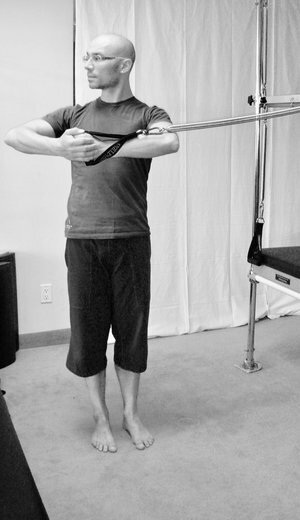 This cue is often given in standing or upright kneeling positions. Intended Goals: Release hip flexor tension and lessen the low back arch (lordosis). Common Negative Result: Tucking the sacrum under and shifting the hip joint forward, out of a neutral position. A cue is only as good as its result and there is a time, a place and a person for almost every cue out there. Part of the beauty of private training sessions is that a skilled teacher can play with cues and personalize them to what is most effective for each individual. In group classes teachers can’t possibly be as specific so pay attention. Did the cue improve your motion? Did it better activate the targeted area? Did it improve your range of motion or efficiency? If not, try the following suggestions. Try the cue at 50% intensity and see if it simply needed finesse. Mentally toss out cues that aren’t helping you or replace images with ones that work for you. We are dynamic beings. A cue that didn’t work a month ago may now make sense. As always, we would love your feed back. What are some of your favourite postural cues?